Free Mission Trip Blog | God Is Very Good! God is very good. We have just finished at the crusade where 250000 people have gathered to worship the living God who is most definitely alive and being faithful today to his promises today. Amen amen amen! We were able to walk out into the crowd and see at close range the faces of the people we have been ferverently praying for from a distance. Lives are truly being touched, lives set free in Jesus name and bodies being healed. Daniel Kolenda had the priviledge of opening the word this evening. He spoke on the passover power of the blood of Jesus. People were asked to lay down their charms and idols which were burnt later and curses were broken in Jesus name. Amen. A very powerful move of the Spirit was witnessed tonight. Lives were also touched when Reinhard Bonnke prayed for the sick. Children, old people, men, women and even the soldiers were ferverently praying. We heard 3 testimonies of peoples lives changed before having to leave. One boy walked for the first time in five years, one grandmother could see again after 3 years being blind and one boys eyes were healed. God still heals today and that I’m certain. And my faith to believe in the miraculous back in nottingham UK has grown and I’m now very expectant. Amen. I look forward to a long sleep however I’ve just just been told bus leaves at 5.30. The 2010 UK winner. He is 31 years old from Nottingham Christian Centre. 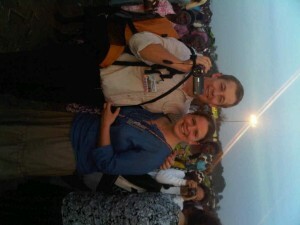 Richard brought his wife, Tara, along to Ogbomosho, Nigeria.